We must thank the consumer electronics (PCs included) people who have developed cost-effective technologies that us pro audio folks can benefit from. Case in point is the advent of portable digital audio players (MP3 players). In the pro audio world, there is a number of manufactures that have developed and bring to market cost-effective digital or solid state audio recorders/players which have gained acceptance in many applications for field recording broadcast, sound reinforcement, and public address systems. It is not unusual now to hear these devices in use in many public spaces such as department stores, where a customer can press a call button on a pillar, which triggers a pre-produced announcement over the PA system alerting staff that “a customer requires service in the sports department,” or an announcement at the airport reminding us that the airport is a non- smoking environment. There are many environments where a message has to be communicated to the masses either by immediate command through the push of a button, or triggered by a third-party control or by some internal scheduler. There is a number of fruitful choices from a number of manufacturers (TOA, Nel-Tech Labs, Raicom, TASCAM, Stop & Listen, etc.) that have developed products for common commercial audio applications. A recent addition to this arena of digital audio players is the Schedulon from Technomad (check out http://www.technomad. com). Yes, the folks who bring us military/ weatherproof-grade loudspeakers. 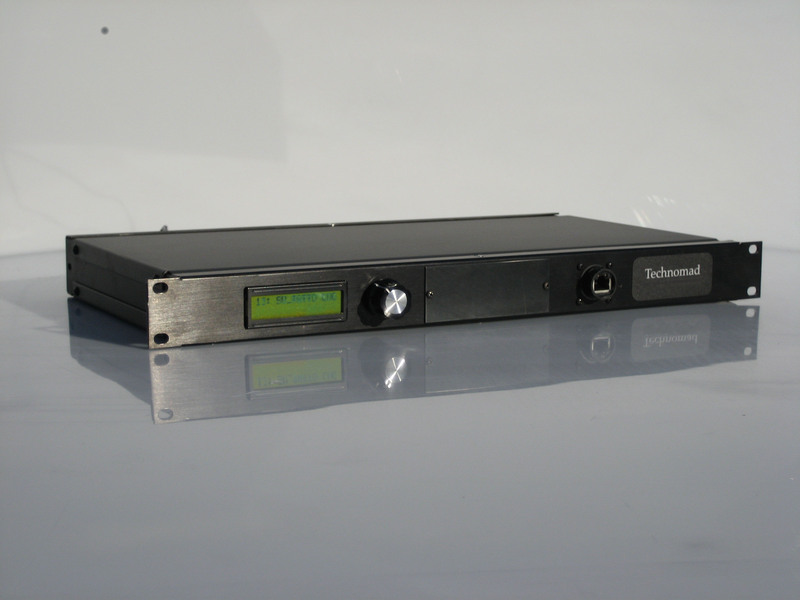 The Technomad Schedulon a rackmount (1U) MP3 player/recorder with a built-in scheduler that can be used in a variety of pro audio and commercial security applications. The Schedulon is a rackmount (1U) MP3 player/recorder with a built-in scheduler. With the use of a web browser or by navigating via a front panel knob and display, the Schedulon offers the ability to upload audio files, schedule playback of audio files, and automate playback of audio files. The unit utilizes flash-RAM memory, which makes this unit more dependable than a PC-based solution. Although the unit has an onboard clock, audio files can also be triggered by an external clock server. The Schedulon can record audio from its stereo line-in jacks Â audio is encoded as high-quality (192 kbps) MP3 sound files and assigned to any desired knob location for playback. The better option is to upload the audio file using the browser application or to upload files to Schedulon’s USB memory drive from your computer. The applications for the Schedulon and many similar units are numerous: repeat messaging at airports, department stores, malls, training facility scheduling (schools, airports, hospitals), corporate audio (no CDs to misplace), training, sports facilities (load team music or special effects for instant playback), automatic safety announcements, theme park audio, sound effects, pool-side music or DJ applications, and much more. Upon evaluation, it did not take much time to connect the unit and navigate through the browser. Once connected and logged to the unit, you will discover six tabs (Status, Settings, Control, MP3 Upload, Knob Set, Scheduler) allowing you to view and enter values via drop-down selection. All but the Status tabs permit entering and adjustments to the unit. Without the use of a computer, you can navigate through the functions with the front knob and display, but this makes it taxing. Different play modes can be assigned to each knob position: play forever/unit stopped by user (for sirens); play once, then stop automatically (for songs like the national anthem); and play while button held in (for sound effects). The fact that each knob position can store a different audio file AND play behavior is unique in the marketplace, I believe. The evaluation unit had 50 or so preloaded audio files, most of which, to no surprise, had military applications. One surprise that happened when I logged on was that the unit announced its IP address, which could inadvertently be announced over the PA system for all to hear. Generally, the unit worked to expectation, and can be recommended for applications as previously noted. The unit we evaluated did not offer any contact closure or RS232 port for interconnectivity to other control systems. The audio outputs are unbalanced (not-so-pro audio), and the device’s “current time” is found at the Status tab; however, the current time should also be at the Scheduler tab for ease of reference during programming. Additionally, the unit data port is found in the front panel, something I would not expect if this unit is to be driven by external IP-based timer or clock. Projects or systems requiring additional features may not find this unit appropriate, but overall, the Schedulon is a good performer and is basic in operation and functionality. Devy Breda, CET, CTS, is an Audio Visual Systems Designer at Mulvey & Banani A/V, a division of Mulvey & Banani International Inc. ( http://www.mbii.com ). This review appeared in the December 2008 issue of Professional Sound.